Rediff.com » Business » Was Rs 42,200-crore worth dirty money deposited in Jan-Dhan accounts post DeMO? Was Rs 42,200-crore worth dirty money deposited in Jan-Dhan accounts post DeMO? The CBDT has begun the process of matching the deposits in accounts opened under the Pradhan Mantri Jan-Dhan Yojana (PMJDY), or Jan-Dhan accounts, with the profile of the depositors. The government has found “suspicious” over 60 per cent of the money deposited in 37 million Jan-Dhan accounts in the weeks following the note ban announcement in 2016. Documents reviewed by Business Standard showed that cash totalling Rs 42,200 crore was deposited in 37.4 million of such accounts between November 8, 2016, and December 30, 2016. The deposits in Jan-Dhan accounts stood at over Rs 70,000 crore by January 4, 2017, implying that about 60 per cent of the money was part of suspicious transactions. 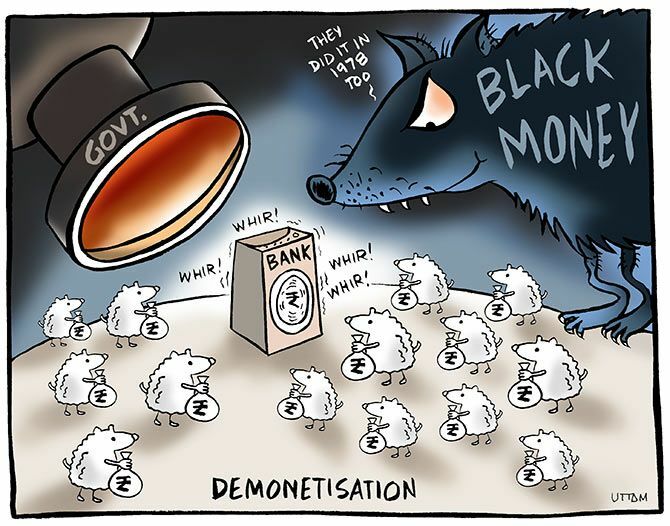 Aimed at curbing the flow of black money, Prime Minister Narendra Modi had announced the withdrawal of old Rs 500 and Rs 1,000 notes on November 8, 2016, and had given a 50-day window to citizens to deposits these notes in their bank accounts by December 30, 2016. Finance secretary Hasmukh Adhia confirmed that the Central Board of Direct Taxes (CBDT) had received 30 one-time reports from 187 ‘reporting entities’ (mostly the branches of various banks), and that investigations were going on. “Prime facie, these deposits cannot be said to be illicit. The information has been received by the CBDT for necessary investigations and consequential actions,” Adhia said in an e-mailed response to queries by Business Standard. “In cases where the deposits do not match the profile, necessary investigations are done, the response of the depositor is taken and assessment is finalised on the basis of the evidence gathered,” Adhia said. The deposits will be termed illicit only after the findings of the investigations are validated by the courts. “This is a time-taking process,” Adhia said, adding these bank accounts could not be frozen without following the due process of inquiry. Till November 9, 2016, a day after demonetisation was announced, the total deposits in the Jan-Dhan accounts stood at Rs 45,600 crore. Within a week, the deposits rose sharply by 41 per cent to Rs 64,200 crore, eventually peaking to Rs 74,600 crore by December 7, 2017 - marking a 63 per cent jump from the day after demonetisation was announced. A few days later, the Union government had said that it has put a limit of Rs 50,000 on deposits in Jan-Dhan accounts, slowing down the growth in deposits in such accounts. The PMJDY was launched in August 2014 in a bid to increase banking penetration in the country. Bank accounts under PMJDY do not require maintaining a minimum balance, and there is no restriction on depositing money in such accounts, which are opened with full know-your-customer (KYC) documents, Minister of State for Finance Shiv Pratap Shukla told the Lok Sabha last month. Till August 29 this year, Rs 82,100 crore were deposited in 326 million bank accounts under the PMJDY. According to the official data, depositors started withdrawing money from their Jan-Dhan accounts from the first week of December 2016. The total deposits in Jan-Dhan accounts kept reducing and fell by 15 per cent to around Rs 63,000 crore by the end of March 2017 against the December 2016-levels, before the declining trend was reversed in April 2017. On November 29, 2016, the Reserve Bank of India had placed a limit of Rs 10,000 on monthly withdrawals from Jan-Dhan bank accounts “with a view to protect the innocent farmers and rural account holder of the PMJDY from activity of money launders”.